We’d love your help. Let us know what’s wrong with this preview of Hazel Creek by Walt Larimore. To ask other readers questions about Hazel Creek, please sign up. Christian/Fiction Covers that are Beautiful!! “Hazel Creek” by Walt Larimore, published by Howard Books. Did you ever want to read a book that you can just sit down and enjoy, one that deals with old time traditions and values? How about one that is family and Christian based? How about one that has minimum violence and no sexual content? If you would like to read a book with those characteristics, read “Hazel Creek”. A story that takes place in the Smoky Mountains between 1924 and 1925. An era that saw logging co “Hazel Creek” by Walt Larimore, published by Howard Books. A story that takes place in the Smoky Mountains between 1924 and 1925. An era that saw logging coming to the Smokies and a family that tries to maintain their way of living when a logging Company will do just about anything to get their hands on their land. The family, the Randolph’s, show the reader not only the good times that can be had in a harsh environment, but also show how difficult it was to provide education, food, and shelter in this environment. The author spent ten years doing research for this book, and four living in the area to authenticate not only the speech but to ensure that he portrayed the true lives of the mountain people. A very nice read, sometimes a little campy, but definitely a worthwhile read that takes the reader back to a bygone way of life. This is to be the first in a series of three books that follow Abbie Randolph through her life. The book does end, however, at a place where you would not have to read the next in the series. The main reason that I wanted to read this book was the setting, the 1920s Smoky Mountains. I'd say that in this facet, the book didn't disappoint. I did enjoy the setting, but the story wasn't really a hit for me. There were some extremely sad aspects that just weren't for me, personally. The heroine is very young, which reads a little differently than what I was expecting. She's young and she acts young. In a way, it's sweet, but in other ways it's a little slow. I really liked her relationship with her family, especially her father. However, on the flip side, that made the tragedy so very sad. There was quite a cast of supporting players (the "Haint" was especially fun), and the pace was slow and steady. Both of these are things that I liked a lot about the book. It was just the sad overtones that made in into a less enjoyable read for me. If you love a tearjerker, you may like this one a lot! Overall, a tearjerker with a great setting and characters, just a bit too melancholy for me. Many of the endorsements for “Hazel Creek” said this novel was much the same as the infamous “Christy” novels and while I never read “Christy”, only saw the movie, I can say I add my agreement to theirs. Set in the back hills, the story has all the intricacies of how the people thought, talked and lived their lives. Tension and drama crowd the pages, but what I loved most about the story is how I as a reader, got to taste and experience these characters’ lives. Their struggles and desires. The no Many of the endorsements for “Hazel Creek” said this novel was much the same as the infamous “Christy” novels and while I never read “Christy”, only saw the movie, I can say I add my agreement to theirs. The novel is a bit of a tear-jerker and provoked some wild swings of emotion from me. From fear (what. a. villain) to anger (at what the lumber company was doing to the mountain people). It has just about a bit of everything for every reading taste. I do think in that “bit of everything for every reader” some of the story elements got lost. More focus was given to the lumber company at the beginning and end of the book, but I felt we lost that in the middle. There were times I got a bit lost in all the setting and description, and towards the end I hurried the story just a bit to finish, but it has that quality about it, a quality rich in character and their lives. It’s a well-portrayed novel. This review is my honest opinion. Thanks to the publishers for my copy to review. I really enjoyed this book. Felt like I was there. Nicely written. Looking forward to book two. Good book. I would Love for he story to continue. Have you ever read a novel that contains that “special something” for you? That something that draws you in and won’t let go? It’s a something that’s difficult to put your finger on, but it’s there. That’s what Hazel Creek did to me. I’m not sure if it was the protagonist, Abbie Randolph, and how she made me think of my Grandma who grew up in the WV hills; or if it was the setting, The Great Smoky Mountain National Park is where hubby and I spent our honeymoon. Whatever that “something” is, it worked for me. Hazel Creek is told from the perspective of Abbie Randolph on her 100th birthday, telling her physician the story of a specific time period in her life. The time is a particularly difficult time in her life and a difficult time in the fate of the Southern Appalachians. As she relates her experiences of growing up in the Hazel Creek Valley of the Great Smoky Mountains, we are introduced to a cast of interesting characters and we learn of old highland traditions. We meet an unscrupulous lumber company man, an herbal woman midwife, Native Americans, Russian Gypsies, a famous writer, a real-life haint and so many other interesting folks living in her community, during 1924-1925. This was a time when commercial lumbering was threatening the traditional ways of the Southern Highlanders, in the name of “progress”. Clear cutting entire old growth forests, which caused irreparable harm to the hills and valleys, was the norm. This practice made lumber barons filthy rich and greedy for more. We hear the story of 15 year old Abbie Randolph and her family’s struggle to maintain their homestead, one that her Grandpappy settled. With threats from the local lumber baron’s henchman, and the tragedy of loss, Abbie must help save her family’s land and raise her 4 younger sisters, all while maintaining her faith. I absolutely adored all of the Randolph’s and their friends. I managed to read this book in just a few hours, it was so engrossing. I didn’t want it to end, and I remain hopeful that Dr. Walt will write more about this interesting family and their adventures. I would love to hear more about Abbie and Bobby Lee and how their life together pans out. I would also like to learn whether Whit goes onto be a famous singer, or if Corrie marries a rich man. If you have any interest at all in Appalachian mountain peoples, this is a book I would highly recommend you read. The characters are so very interesting, and I love how the author weaves so many facts and old traditions into this work of fiction. Hazel Creek back in 1924 was what small mountain towns should be. Where people respected the land around them, and found value in family, friends, and God. Scattered around the outskirts of a larger town, owned predominantly by the Calhoun Lumber Company. There goal since convincing the railroad line to come through town was to clear cut most of the virgin forest owned forever by the mountain people in the Southern Appalachians. If people didn't want to sell, the company found ways to obtain the Hazel Creek back in 1924 was what small mountain towns should be. Where people respected the land around them, and found value in family, friends, and God. Scattered around the outskirts of a larger town, owned predominantly by the Calhoun Lumber Company. There goal since convincing the railroad line to come through town was to clear cut most of the virgin forest owned forever by the mountain people in the Southern Appalachians. If people didn't want to sell, the company found ways to obtain the land even if no one could prove their ways were less than honorable. Nathan and Callie Randolph are a few of the last true mountain families that own a considerable amount of pristine forest lands with some amazing older and more valuable trees that Calhoun wants more than anything. But since the this land has belonged to the Randolph family for generations, Nate has no intention on selling. But after many run-ins with men from the lumber company, Nate is finding himself and his family becoming the prime target from the lumber company and they will stop at nothing to ensure they get the land. I received Hazel Creek by Walt Larimore compliments of Howard Books, a division of Simon and Schuster Publishers for my honest review. I have to say I love this book from beginning to end. I didn't want to put it down because the story and the characters are so likeable and believeable. There is Abbie, the oldest of the Randolph children that is noticing boys in a whole new light, especially the Sheriff's son, Bobby Ray. She is called upon to help her mother Callie out, who is having a difficult pregnancy and has to rest as much as she can. This puts Abbie in the position to act as almost a mother-figure to her younger sisters. I love books like this, they always make me think of a favorite movie. These stories are told as the reminiscences of an elderly woman. Mrs Abbie. In the stories we learn of the life of Abbie Randolph a young woman who grew up in the hills of the Great Smoky Mountains. As hill folk, her family is leery of outsiders and lowlanders, and especially her father is leery of the logging company who is trying to force him to sell their land. And with good reason when they bring in a man who tries his be I love books like this, they always make me think of a favorite movie. These stories are told as the reminiscences of an elderly woman. Mrs Abbie. In the stories we learn of the life of Abbie Randolph a young woman who grew up in the hills of the Great Smoky Mountains. As hill folk, her family is leery of outsiders and lowlanders, and especially her father is leery of the logging company who is trying to force him to sell their land. And with good reason when they bring in a man who tries his best to intimidate them into selling. Abbie has a wonderful life, but it is not an easy life, her momma is pregnant for the eighth time, and she is having a lot of trouble with this pregnancy. The baby is born, but Abbie's momma doesn't make it. Her death makes more work for Abbie, taking care of her younger sisters, and her regular chores, and trying to go to school too. I really felt the pain and sorrow that Abbie experienced, this author has a unique storytelling ability that draws you into the story, making you feel like your there in the Great Smoky Mountains experiencing what the Randolph family was going through. A great story, with promise of more to come. 368 pages $14.99 US 4 stars. This book was provided for review purposes only by Howard Books, no payment was received for this review. Reminiscent of Laura Ingalls Wilder's writing style in Little House on the Prairie, this snapshot of mountain folk, gypsies, and the Great Smoky Mountains quickly draws a reader in. This tale takes place during the Roaring Twenties. The only things that roar in the Smokies are cougars and rifles. Abbie Randolf is forced to grow up quickly and rely on "that ole time religion" when the new age of industry begins to threaten the family farm and their very lives. It is obvious the author did a lot Reminiscent of Laura Ingalls Wilder's writing style in Little House on the Prairie, this snapshot of mountain folk, gypsies, and the Great Smoky Mountains quickly draws a reader in. This tale takes place during the Roaring Twenties. The only things that roar in the Smokies are cougars and rifles. Abbie Randolf is forced to grow up quickly and rely on "that ole time religion" when the new age of industry begins to threaten the family farm and their very lives. This terrific story of a family in the Smoky Mountains will make you feel like you made new friends to keep for life. You'll fall in love with Nathan, Callie, and their five daughters, especially Abbie, whose courage, faith, and love of family strengthen and inspire those around her. Full of adventure and even some romance, Walt's book paints a picture of wholesome living in the midst of struggles. I give it five stars and can't wait for the sequel! 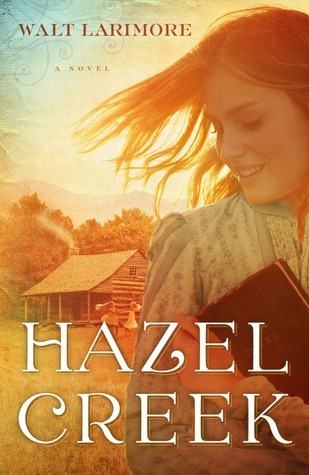 For anyone who loves the Smokey Mountain or stories about the folk who fought a hard living to live and survive in their beauty, Hazel Creek was a wonderful story. The endurance that people must have to live life was very evident not only in the hardships they faced but in the joy from the fuits of their labors was a reminder that hope abounds even in the darkest of times as well as in the celebration of the beauty around them. A must read!! I loved this book. Author Walt Larrimore was a doctor first, in a small town not far from Hazel Creek. His earlier books were full of funny, and sometimes poignent, experiences from that time. His compassion--his "bedside manner"--shines through in his treatment of the characters in Hazel Creek, his first novel. You care about these people. And you care about the things, both tragic and triumphant, that happen to them. It's a good story, well told. I enjoyed Hazel Creek even more than I had expected. It was a compelling, feel-good story of life in the Smoky Mountains in the early 1900s. The story introduced some very likable characters and taught me a lot about folk traditions, both of the mountains and of Russia. I look forward to continuing the saga in Sugar Fork. I have really enjoyed Larimore's previous books. This one is moving awfully slowly. It's an interesting story of a family living in the North Carolina mountains, but there is way more detail to the daily lives than I like. It did get easier to read as the story developed. I enjoyed the author's Bryson City books and I also enjoyed reading this one. Abbie remembers growing up in the Smokey Mountains in the 20's: the rewards and the trials. Well, it felt a tad shortend. Like there were essential details missing. Dr. Larimore is one of America’s best-known family physicians and is listed in the Best Doctors in America, Who’s Who in Medicine and Healthcare, and the International Health Professionals of the Year. His MD degree is from Louisiana State University, with AOA Honors, while his Family Medicine residency, with an emphasis in Sports Medicine was at the Duke University Medical Center, where he was na Dr. Larimore is one of America’s best-known family physicians and is listed in the Best Doctors in America, Who’s Who in Medicine and Healthcare, and the International Health Professionals of the Year. His MD degree is from Louisiana State University, with AOA Honors, while his Family Medicine residency, with an emphasis in Sports Medicine was at the Duke University Medical Center, where he was named one of the top twelve Family Medicine residents in the nation. He also completed a Queen’s Teaching Fellowship in Nottingham, England.